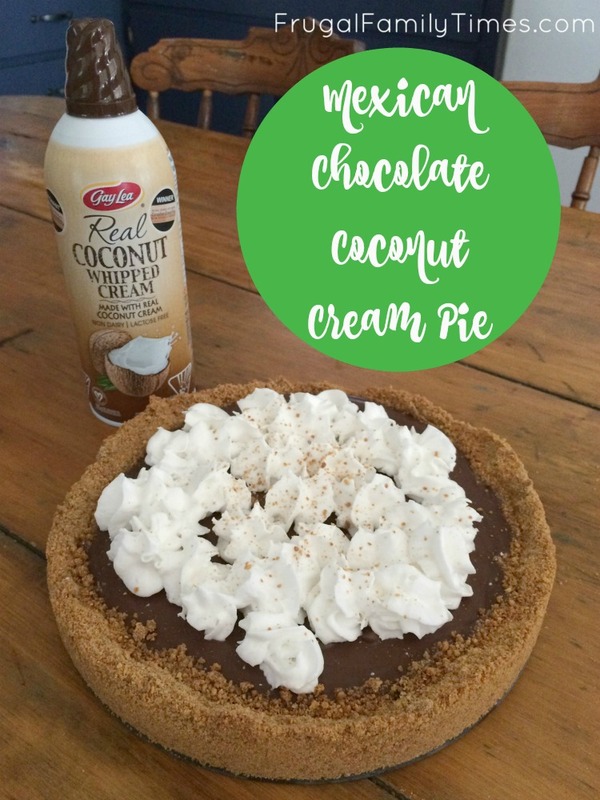 Chocolate + Coconut Cream + A bit of Spice + Pie = Oh my! Yes, please! This delicious dessert was even more wonderful because our darling daughter made it for her Dad and Grandpa for Father's Day last weekend. As she served it to them she had that same proud smile on her face as she did in the days when she served them pies her dimpled toddler hands had made with mud. This time, thy didn't need to pretend to like them - the her baking creations now are delicious. This Mexican Chocolate Coconut Cream Pie is amazing and surprisingly simple to make. This recipe is a wonderful treat. It has a kick of cayenne pepper with the dark chocolate that brings the heat. The cool coconut whipped cream balances it out perfectly and the whole experience feels like a plateful of tropical vacation. It couldn't have been easier to add the sweet coconut cream flavour. Gay Lea makes a convenient Real Coconut Whipped Cream in a fun spray can. And it's made of REAL coconut cream - not just a cheap coconut flavoured chemical. We had no idea about this product before they invited us to try it! Now we're dreaming of other delicious ways to use it - especially with summer here - Pina Coladas anyone?! 2. Reserve 1 Tbsp crumbs for topping. Combine remaining crumbs, 2 Tbsp sugar, 1 Tbsp cornstarch, cinnamon and salt in a bowl, stirring well. Add butter and 2 Tbsp of the egg white (reserve yolk for filling); toss with a fork until mixture is moist but still crumbly. Press crumb mixture into a 9-inch pie plate (or spring-form) coated with baking spray. Bake for 9 minutes or until lightly toasted. Cool completely on a wire rack. 3. Combine reserved egg yolk, 1/2 cup sugar, 2 Tbsp cornstarch, t Tbsp cocoa, pepper and egg in a bowl. Stir well with a whisk. Place milk in a medium saucepan over medium heat; cook until milk reaches 180F or until tiny bubbles form around edge. Gradually add hot milk to egg mixture, stirring constantly with a whisk. Return milk mixture to pan; cook over medium heat 10 minutes or until thick and bubbly, stirring constantly. Remove from heat. Add chocolate; stir until smooth. 4. 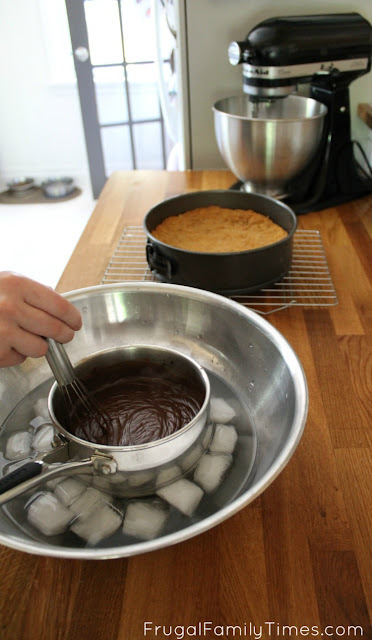 Place pan in a large ice-filled bowl for 10 minutes or until mixture cools, stirring occasionally. Spoon filling into crust and cover the surface of filling with plastic wrap. Chill 3 hours or until set; remove the cover. 5. Add Gay Lea Coconut Whipped Cream over pie. Sprinkle with graham crumbs. Reserve 1 Tbsp crumbs for topping. Combine remaining crumbs, 2 Tbsp sugar, 1 Tbsp cornstarch, cinnamon and salt in a bowl, stirring well. Add butter and 2 Tbsp of the egg white (reserve yolk for filling); toss with a fork until mixture is moist but still crumbly. Press crumb mixture into a 9-inch pie plate (or spring-form) coated with baking spray. Bake for 9 minutes or until lightly toasted. Cool completely on a wire rack. Combine reserved egg yolk, 1/2 cup sugar, 2 Tbsp cornstarch, t Tbsp cocoa, pepper and egg in a bowl. Stir well with a whisk. Place milk in a medium saucepan over medium heat; cook until milk reaches 180F or until tiny bubbles form around edge. Gradually add hot milk to egg mixture, stirring constantly with a whisk. Return milk mixture to pan; cook over medium heat 10 minutes or until thick and bubbly, stirring constantly. Remove from heat. Add chocolate; stir until smooth. Place pan in a large ice-filled bowl for 10 minutes or until mixture cools, stirring occasionally. Spoon filling into crust and cover the surface of filling with plastic wrap. Chill 3 hours or until set; remove the cover. Add Gay Lea Coconut Whipped Cream over pie. Sprinkle with graham crumbs. Are you a fan of spicy chocolate? 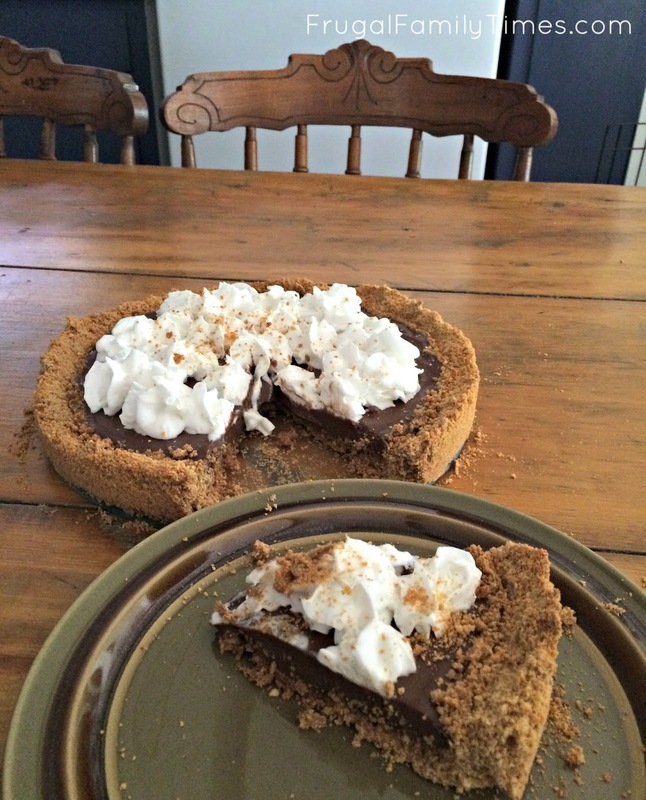 You will be, after trying this pie. Disclosure: We are part of the Gay Lea Ambassador Campaign and we receive special perks as part of our affiliation with this group. The opinions on this blog are our own. It looks gorgeous! I think I will give it a try. I hope it will turn out as good as you. Thanks for sharing. How did it turn out, David? It's easy to make and eat! This looks wonderful! I particularly like the clear photos and instructions for the preparation of this pie. You are a true professional! Simply and gorgeous. This cake have more chocolate on the cake. I will tell my sister about the recipe. I love all kinds of cake. Cake is pretty easy to love, isn't it! It's amazing - thanks for the compliment! 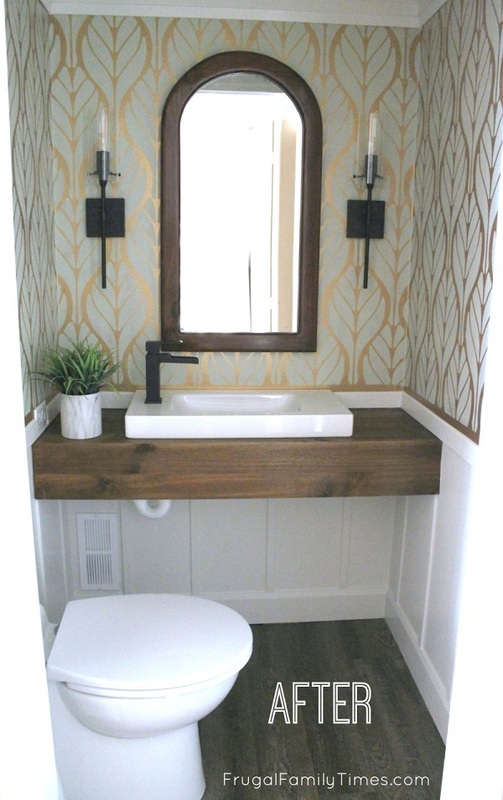 Simple to follow and stunning finish. Gonna make it for my party next Sunday. Thanks for sharing. Oh my gosh! The photo of the pie makes me hungry. I'm a fan of chocolate pie. I will make it asap. Thanks for your tutorial. Wow, both chocolate and coconut cream are my favourite and i think the combination of them is great. And i will bake this cake as soon as possible and hope it is beautiful and delicious as you did.